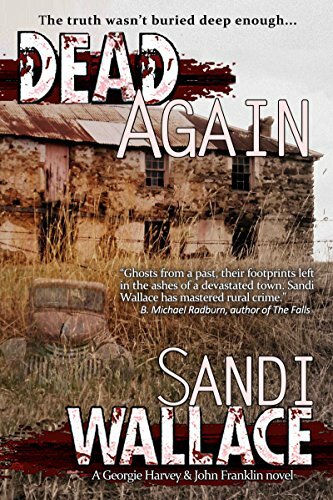 The second in Wallace’s rural crime series, Dead Again is a fast-paced thriller set in the fictitious town of Bullock in the Yarra ranges east of Melbourne, and in the historic spa town, Daylesford. “It is almost two years since wildfires ravaged the tiny town of Bullock, and Melbourne journalist, Georgie Harvey, is on assignment in the recovering town to write a feature story on the anniversary of the tragedy. In nearby Daylesford, police officer, John Franklin, is investigating a spree of vandalism and burglaries, while champing to trade his uniform for the plain clothes of a detective. Dead Again opens with a perpetrator consumed by guilt for a crime he doesn’t reveal. From the first, the reader knows a little more than city journalist Georgie Harvey and Daylesford cop John Franklin. What unfolds is a flawlessly plotted unravelling of a heinous truth. The plot, jump cutting between the two protagonists, never stumbles. The story architecture that leads to a dramatic conclusion is convincing and plausible. Sub plots provide pleasing texture, driving the story forward, affording the necessary complications and frustrations. The result is a rich and satisfying tale. Catch up on the novel’s predecessor is deftly handled. Georgie and Franklin have history, one that is unresolved. Franklin is consumed by an unwavering passion. Georgie is conflicted, her relationship with hot shot lawyer AJ, on the rocks. Wallace develops her characters with considerable finesse. It isn’t easy creating emotional character arcs in a novel heavy with plot. It appears Wallace has a hunger for Wallander in rural Victoria. Both Georgie and Franklin are introspective, troubled, frustrated and hurt. They are mirrors of each other, yet distinct. Wallace applies the same character-developing care in her antagonist. The reader will be forgiven for feeling some initial sympathy for a figure who has plainly committed some terrible act. Dead Again is a brave book. The theme, termed Red Victoria in the narrative, concerns the Black Saturday bush fires of 2009. The horrors of that day cannot be erased from collective memory. The trauma lives on. Stepping into this terrain is dangerous, the author will inevitably be accused by some as cannibalising the tragedy of others for personal gain, a vulture, picking over trauma as though it were carrion. Worse, misconstruing or trivialising real events. These are unfair accusations. Authors travel where their muse takes them. Besides, Wallace is well aware of the dangers. The author treads lightly, defensively, tentatively, as does her protagonist, Georgie, the city-dwelling outsider on an assignment to write a magazine feature. Not trusting her voice, Georgie shook her head. ‘I feel the ghosts of my friends. This is stuff that I wouldn’t believe if it hadn’t happened to me. It keeps me awake at night.’ She rolled her eyes. ‘Hour upon hour, every single night. And the smells…’ Kelly shuddered. In this fashion, the wildfire theme is handled with respect and consideration, like an artefact held in the hand and turned over, sensitively scrutinised. All the incidentals in the story are carefully researched, adding to the social realism that the author strives for. With wit and a sharp eye for the essentials, Wallace has built a story world that feels real. A page turner with much to savour, Dead Again is a moving and highly engaging read. Find out more about Sandi Wallace here. Previous Post Writers chat writing – my debut vlog appearance! Next Post The Cabin Sessions cover reveal!